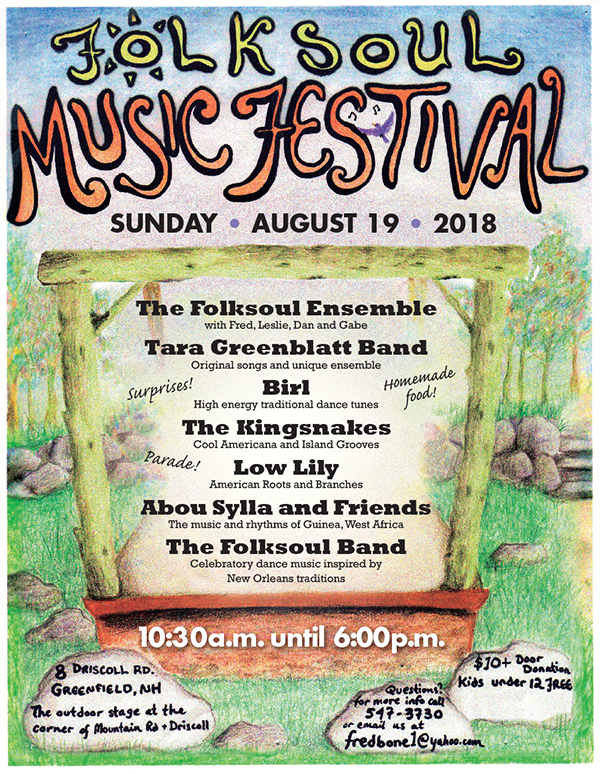 On Sunday, August 19th, 2018 Fred Simmons and Leslie Vogel will be presenting the 9th Annual Folksoul Music Festival on their grounds at the corner of Mountain Road and Driscol Road in Greenfield NH. Featured this year are seven bands, including Low Lily, The Kingsnakes, Abou Sylla’s Monadnock Drum Caravan and Guinean Brothers, Tara Greenblatt Band, Birl, the Folksoul Band, and the Folksoul Ensemble. This event is family friendly, bring a blanket or camp chairs and a picnic if you wish, and/or taste the delicious local foods provided at a couple of vendor tables. Address for GPS: 8 Driscol Rd, Greenfield NH 03047. Please park on one side of Mountain Rd, and enter at the Festival gate. Festival hours: 10:30 am until 6 pm. Come early and stay for the day–the music is absolutely worth it! Fee: $10 donation at the gate; children under 12 free. Please no dogs, except for service dogs. In the event of heavy rain on that day, the Festival will have to be canceled.